TOPO Piedmont Gin is an aromatic botanical mix that appeals to a wide range of palates. We’ve seen many in our tasting room who profess a great dislike for the strong flavor of gins suddenly find themselves with a new friend at the table. The understated juniper allows the ten other spices to really shine through. We’ve put together a collection that truly showcases the glory of this five-hundred-year-old spirit. Enjoy! 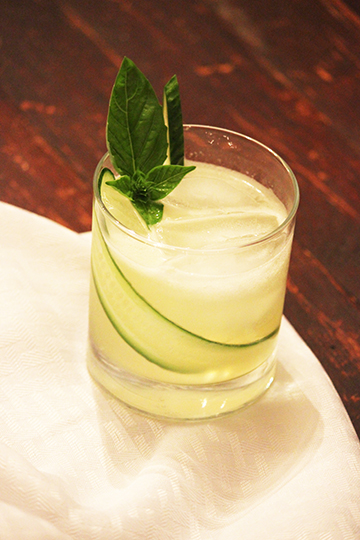 Muddle together cucumber slices and basil leaves. Add to a shaker with ice, gin and lemon juice. Shake vigorously until very cold. Strain into a rocks glass with ice. Add cucumber slice and basil sprig as a garnish. Combine ingredients into a shaker with ice and shake vigorously until very cold. Strain into a chilled martini glass. Garnish with a lemon twist. (This is a recipe for sharing with a crowd.) Recipe courtesy of Bob Peters at The Punch Room, Charlotte, NC. Add ice and combine all ingredients in a large pitcher. Garnish with rosemary sprigs for a great table display. This recipe makes enough for a complete dinner party. The extraordinary mixologist Bob Peters from The Punch Room at Charlotte's Ritz Carlton hotel has got your dinner on the porch covered. Quick to prepare, be sure to have this combination of refreshing tea and sparkling wine ready for the sunset. Recipe courtesy of Fahrenheit Restaurant, Charlotte, NC. Add ice, TOPO Organic Piedmont Gin and all other ingredients to a shaker. Shake vigorously until very cold. Strain into a flute. Add fire stix flower for a beautiful garnish. This cocktail comes to us from our friends at the breathtaking Fahrenheit Restaurant in Charlotte. The balcony overlooking downtown is the perfect place to enjoy the blend of flavors in this mix. Combine ingredients into a shaker with ice. Shake until very cold. Strain into a chilled martini glass and garnish with a lemon twist. Add gin, blueberry puree and lemon juice to a shaker and shake vigorously until very cold. Pour into a chilled martini glass and garnish with a lemon twist. *To make Blueberry Puree: In a blender, mix 1 pint of organic blueberries with 1/4 cup of simple syrup until smooth. Strain through a small strainer, or leave unstrained for more color and chunks of blueberry. Combine ingredients in a shaker, add ice and shake vigorously until watermelon is pulped. Strain into a chilled martini glass. To make the shrub, simmer lavender flowers, sugar and water on low heat for 3 minutes. Add vinegar and lemon zest and simmer for 5 more minutes. Remove from heat and cool. Strain into a glass jar. Shrub will keep for several weeks. To make the cocktail, pour gin, shrub and seltzer into a rocks glass and stir. Add lavender sprig and lemon slice for garnish.